Pattern: Cordova by Michele Wang for BT Winter 15. Yarn: Brooklyn Tweed Shelter in Faded Quilt. If you are Canadian I highly recommend buying it online from Beehive Wool Shop like I did, fabulous service, Canadian dollars, free shipping on orders over a certain amount. Lovely all around. I've already gone on and on about all the measuring and math that went in to knitting this sweater for Chris. I'm not going to sugar coat it, this was definitely a labour of love and despite the fact that I churned in out in two weeks flat, it was a pretty epic knit because I had to re-knit several parts more than once after realizing that my first modification attempts weren't going to work out as planned. This sort of thing is not for the faint of heart, but the results are so worth it! I wasn't certain that I was going to feel that way during the process, but I can honestly say that now that it's done and Chris wears it every single day, I'd do it all over again in a heartbeat. Chris loves it, I love it, everybody wins! 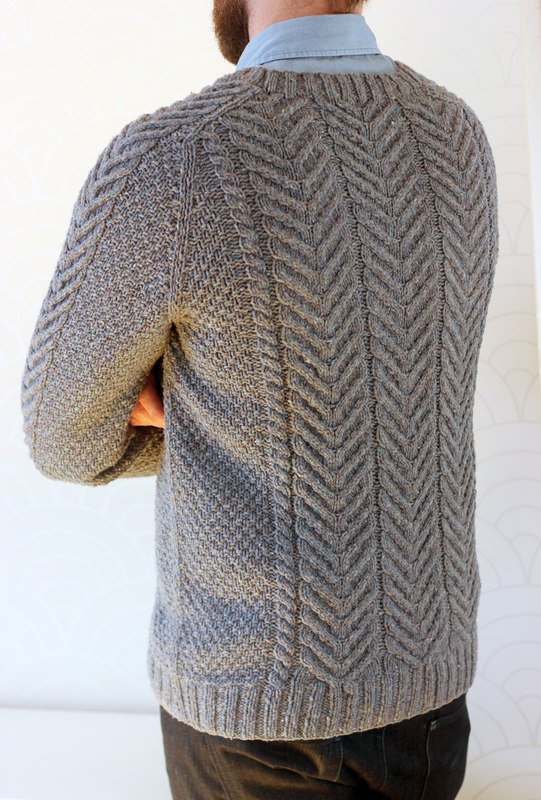 I am crazy about the textures in this sweater. I love the crisp cables. I think that the three identical cables running straight up, side by side, is such a modern take on the classic cabled sweater. It's very tempting to want to go full throttle with as many different complicated cables as you can fit on an allover cabled garment like this, and sometimes that's great, but in this case, I really love the simplicity. I'm also really pleased with the decision to use double moss stitch as the texture alongside the cables, paired with the stockinette stitch seams the lines are just amazing. Like all Brooklyn Tweed patterns, there is so much attention to detail included within the pages of this pattern and I really appreciate that. It makes for such an enjoyable knit. I worked an extra knit stitch on either side of each of my pieces (each sleeve as well as the front and back piece) so when seamed you get a really neat stripe of stockinette up the middle of all that moss stitch texture that just makes my heart sing. Oh, and to take it way over the top into perfection-land that perfect seam runs right up from the ribbing. Those simple details are the reason I'm a knitter. I love working with Brooklyn Tweed yarns. They are so different from our TFA selection and diversity is a good thing! This man-sized sweater only took 11 50g skeins, I have 7 leftover for another project. I always err on the side of too much yarn, running short is every knitter's nightmare right? And I love the colour so I'll have no problem using it again.